An engaging, at times playful, overview of the major art movements through history, all placed in historical context. 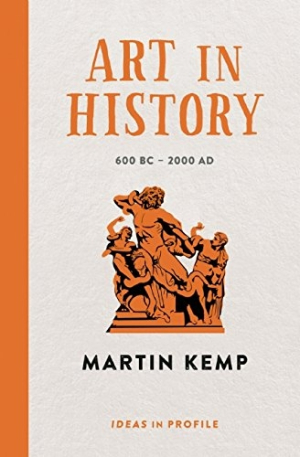 Martin Kemp, emeritus professor of the history of art at Oxford, as well as an expert on da Vinci, has several published books to his credit on the history of art. Part of the Ideas in Profile series, Art In History stands apart in considering art chronologically, with individual artists, movements, and pieces placed in their larger historical context, Kemp also engages considerations of economic and material influence on the artist, and even the art viewer as well. Overwhelmingly, though, the book is a historical look at art, and often shows the historical influences and events that shaped the art of the times. The book offers an overview to the major art movements through history, offering just enough detail to give a general understanding, and to perhaps inspire further reflection on movements or painters that interest the reader. Toward the end of the book, as the movements come in more rapid fire than for earlier periods, and as the movements themselves become more playful (Dada, surrealism, postmodernism), Kemp’s style grows more lighthearted and conversational as he whips through the movements, highlighting one or two representative painters at a time. Black-and-white images and two-color printing enhance visual interest with stylized illustrations illuminating some of Kemp’s key points, some of which are comics, adding a note of humor. The book would be a fine introduction to a reader who has some interest in art but wants a more general overview and historical context, and the engaging style and design will appeal to a range of ages.